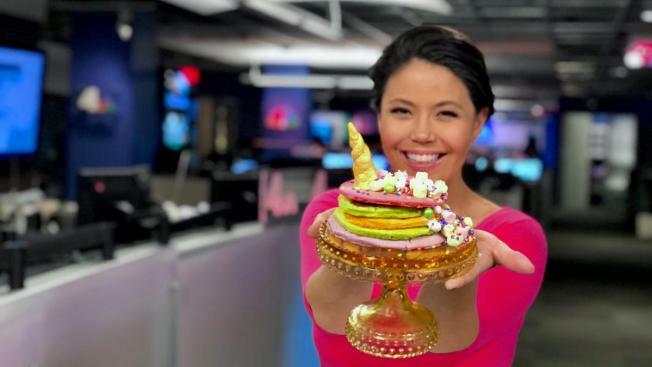 Easy DIY Unicorn Pancake Recipe! In honor of National Pancake Day, September 26, News4’s Angie Goff has a fun and easy DIY recipe! Make your own magical stack with Angie’s recipe below or watch our Facebook Live here. 1. Make pancake mix and separate in two different bowls. 2. Mix a little food coloring gel into batter. Each bowl should be a different color. I'd stick to 3-4. 2. Make pancakes- remember you don't want them too golden. It will change the smooth look of the pancake. 5. Add unicorn horn. To make this take a couple little pieces of fondant and roll them into two little horns. Then put them together and twist to the top and shape like you want. Spray with frosting glitter spray if you want a different color. Let sit so it can harden and dry. 6. Using frosting... put a spot on the top of the cake where you want the horn to go. Then apply frosting all the way down the back side of the cake. You can then stick on sprinkles, candy and marshmallows. 7. Add a little syrup, or your choice of topping(s), and indulge! What's your favorite topping? Comment below!